Garden of Aaron: How Hot Is It? 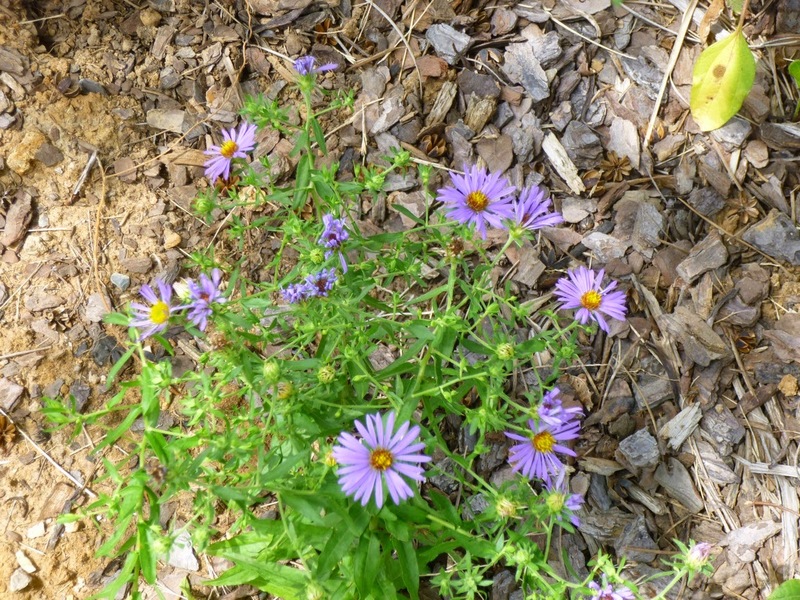 This aster has started flowering four months ahead of when it is "supposed" to bloom. A comedian might say, "It's so hot that the catfish are already fried when you catch them." It's so hot that Aster oblongifolius "October Skies" -- which every source I've seen says is supposed to start blooming in September or October -- started blooming about a week and a half ago ... in late May! It has been kind of hot and very dry lately. Technically we received about 2.5 inches of rain in May, but that's what fell at the airport mostly in a two-day deluge. I don't think we received nearly that much here (though lacking a rain gauge, I can't say for sure). And temperatures have been running about 10 degrees above normal - in the high 80s to near 90 most of the past few weeks. This is my first year growing October Skies aster, so I've no idea if this is normal behavior when October Skies is grown in the Southeast (the sources I've consulted describe aster behavior in New York City and Delaware). Will October Skies flower from now until frost (which would be awesome) or will it poop out in the mid-summer heat? Stay tuned to find out!